A N.U.N.S. 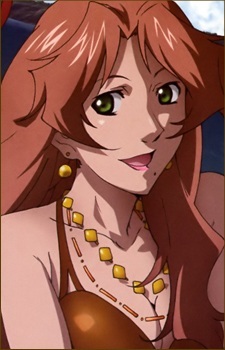 General Staff second lieutenant attached to the Macross Frontier, she is also the President's daughter. A good thinker, she has both brain and looks. After having graduating from university with honors, she joined NUNS and is being fast-tracked into the elite. A very competent officer, she sometimes lacks flexibility. In the Miss Macross contest, she would be placed on a championship level (she was actually a runner-up on the 8th contest). Currently in a relationship with Leon Mishima without her father's knowledge. Was formerly in a relationship with Ozma Lee. She became part of the SMS Macross Quarter crew during a mission to rescue the Macross Galaxy fleet from the Vajra.